Our last update was almost a month ago, so I wanted to write about what’s been going on with us – which to be honest – has been very little. Yes, we are full-time travelers. 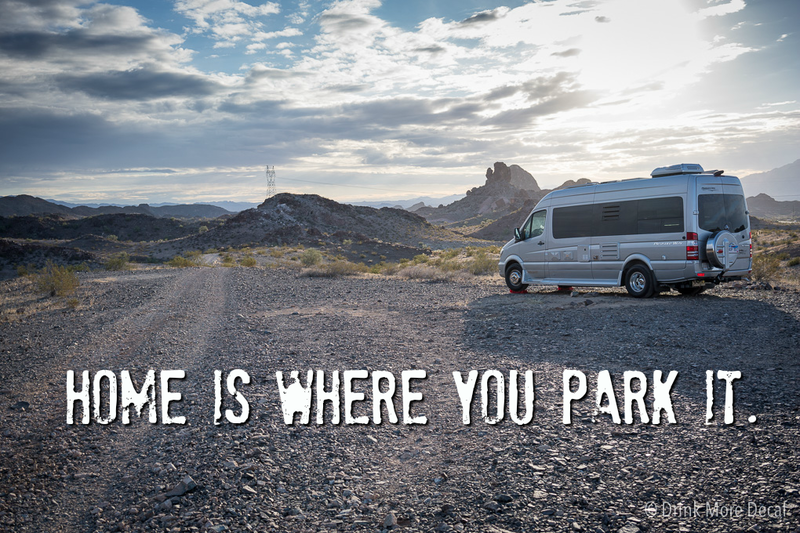 Yes, we live in a hyper-mobile RV and are ready to change locations at the drop of a hat. And yes, I have a chronic illness. Kerplunk. You know what they say about the best laid plans, right? Tomorrow is my 6th anniversary with Gastroparesis. To put it simply for anyone unfamiliar, it’s a chronic digestive disorder. I’m not able to eat all the food my body needs, and, I’m not able to absorb all the nutrients from the food that my body is able to take in. That combination of factors places me in a constant state of malnutrition. And, as a result, I’m often exhausted. Interestingly enough, Gastroparesis is really a moving-target kind of illness. It has a lot of ups and downs, mostly driven by patterns. It affects women more than men, changes with the hormonal cycle throughout the month (I think most women with GP can time their cycle based on their digestive discomfort), changes throughout the day, and even seasonally. Every winter – I tank. I hit bottom. You’d think after 6 years, I’d remember, and plan accordingly, but after having energy in the summer, I always forget. I always think I’m getting better (when in reality I’m probably just in a state of remission). In fact, yesterday I realized every life-changing idea we’ve had over the last few years was launched in the summer time. Summer is when I tend to feel somewhat closer to normal, for longer stretches of time. We hadn’t planned to be in one place for several months like this, but I have to say, Lake Havasu, Arizona is an amazing place to be “stuck”. Knowing what we know now, I plan to be stuck here every winter!! Obviously, I don’t feel stuck at all… but you know what I mean. The weather in Lake Havasu has been constant since November, with temperatures ranging from 40-60 each day. Most days are gorgeous, some are extremely windy (up to 20 or 30 mile per hour winds) – but that doesn’t even happen every week. And the people? Everyone is friendly – and I mean everyone! The locals and the seasonal folks are all extremely nice. I think we actually know more people here than we have in any neighborhood we’ve lived in over the past several years. Unfortunately, I haven’t been up to doing anything social, but there are many days when we head out to walk Frodo and that’s at a nice time of day so everyone else seems to be out chatting, or walking their dogs as well. As you drive around town, you’ll notice stickers on quite a number of cars that say, “No Bad Days – Lake Havasu” – and it’s true. There are NO bad days here. Lake Havasu quickly became a favorite place of mine and I already view it as a sort of “home-base” for us, likely at the RV Park where we are spending this winter. As the days progress, you see people come and go, and folks who come year after year run up to each other and give a pat on the back or a hug. It’s like summer camp. Only in winter. For adults. For reals. Who wouldn’t love it here? And relatedly, I think there is a lot of benefit in living full-time in a setting such as an RV park, or a Trailer Park. I know if I’m not seen for a few days, our various neighbors would ask Dave about me, how I’m feeling, and if there’s anything I need. You just don’t experience that standard suburbia. (Places like this sound very cool!). < 2015 Year in Review: 3,872 Miles Traveled & 53 Books Read! Sorry to hear you haven’t been feeling well. Where are you staying in Lake Havasu? We just booked a stay for late August and had difficulty choosing an RV park. We finally picked Islander on the lake. Hope spring comes quickly and finds you feeling great! We’re currently staying at Campbell Cove. — Wait, you’re going to be here in August? AUGUST?! Wow! You guys are really brave! Campbell Cove looks very nice! Oh, correction, we’re actually arriving Sept. 1. I think it’s not so much brave, as more wussiness when it comes to cold. Bring on the heat! We LOVE the heat. You know what I really love? Walking around at night when it’s in the 70s or 80s in shorts and sandals, and lounging in the lake or pool by day. If the water is under 85F, Imma gonna hold out. 🙂 We spent way too many decades in New England with maybe 8 to 10 weekends all year where we could really spend time at the lake or pool or ocean. We have been to the hot desert places in the summer and I don’t think I’ll ever get enough. I know just what you mean! When I lived in Texas my favorite time of the year was summer. Dry heat is awesome! I’ve been unsure though about what it will be like in an RV though, but I’m sure we’ll find out soon enough!